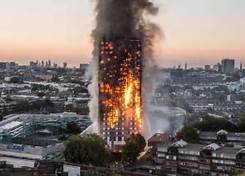 The terrible tragedy at Grenfell Tower is a crime against working class people committed by the Tories with their anti working class policies on deregulation and austerity. It revealed the deep class prejudices which inform the behaviour of the Tory council. More than this, it is an accusation against the whole system of government from top to bottom. The UK is not a democracy and this crime was not a failure of democracy but a measure of its absence. In our ‘elected dictatorship’ government behaves irresponsibly because they can. Concealing the truth and covering up their actions is normal. They rarely get caught out. Unaccountable government made unaccountable decisions with fatal consequences.